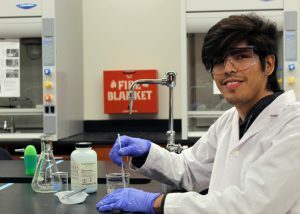 (HARLINGEN) – Uriah Guerrero played with chemistry sets instead of toy cars and watched science channels instead of cartoons and now he is living his dream at Texas State Technical College as a Chemical Technology student. The Harlingen native first arrived at TSTC as a biology dual enrollment student when he was a senior at Harlingen South High School. So, naturally, when he graduated he continued pursuing biology at TSTC for an associate degree, but as he learned more about TSTC he discovered Chemical Technology and immediately knew that’s where he needed to be. “I needed to make this switch. This program is laying the foundation for everything I want to be when I grow up,” he said. Guerrero hopes to one day be Dr. Guerrero and work as a biochemist researching medicines and their interactions on the human body and diseases. The 22-year-old said he knows he still has many more years of school ahead so in the meantime he plans to use his associate degree he’ll be earning in Spring 2019 to work as a chemist creating polymers, or plastics. Already as a student, Guerrero is already learning how to make plastics and resin and learning skills in instrumental analysis, organic chemistry and chemical calculations, all in TSTC labs. Guerrero’s Chemical Technology Instructor John Hamilton said it is Guerrero’s interest in chemistry and his willingness to learn that’ll help him succeed in the field. Guerrero, who is also a work study for the Chemical Technology department, is also working to rebuild the Chemical Technology student club. For more information on TSTC’s Chemical Technology program go online at tstc.edu.